The wind all week was roaring outside my windows like the proverbial lion is supposed to do this early in March before leaving like a lamb when April arrives. I’ve lost a dozen shingles off the roof and I’m not entirely sure how to handle that, so I’m applying the Scarlett O’Hara Rule and worrying about it another day. Winds were recorded as high as 50 miles an hour and one of my favorite restaurants lost its roof in the middle of the day with the place full of diners. I’d just been there the day before! No one was hurt but they’ll be out of business for a while. Thursday was a ball buster of a day. I need a new expression. I just used that one a few blog entries ago but it really does describe my long, hard day. I got up early to go to the gym, then came home for a quick shower and a can of Slimfast for lunch before going off to my book club. After book club I went to a lecture titled, “Take a Walk on the Sunny Side” which was about great books that will warm your heart and make you laugh. After the lecture I headed north a few miles, to the funeral home for my sister-in-law’s visitation. When I added the visitation to my schedule I thought about skipping the gym but I couldn't go Friday, Saturday or Sunday and I worried that if I skipped the gym so many days in a row it would be like starting all over again on Monday. I couldn’t skip book club because it would have been a pain to return the book and get the new one from the facilitator and the librarian's lecture was a RSVP, limited seating event and it wouldn’t have been fair to someone who couldn’t get in for me not to show up. I guess what I’m trying to say is I didn’t plan a ball buster day, it just happened and I couldn’t fix it. I found out at the funeral home that my sister-in-law died from chocking on a pill. How does that happen in a nursing home where aids stand there watching you take your medications? A nurse gave her the Heimlich Maneuver but it didn't dislodge the pill and/or they gave it too late. I can make peace with anyone dying of natural causes but this news was upsetting. If you’re not a reader you can skip this paragraph listing the books the librarian raved about at the lecture. I go to this particular event every year, not so much for the book recommendations but because the librarian is so funny and animated in telling about the books and it’s probably no coincidence that it happens to be Gilda’s LaughFest week in town. It started out as a small fund raiser for Gilda’s Club but is growing into quite popular draw. 50,000 people come to town to see both well-known and new comer comedians. Comedy is King in every venue we have for ten whole days. The books: A Man Called Ove by Fredrik Backman, Lost and Found by Brooke Davis, Last Bus to Wisdom by Ivan Doig, A Murder of Magpies by Judith Flanders, Etta and Otto and Russell and James by Emma Hooper, News of the World, by Paulette Jiles, One Plus One by JoJo Moyes, My Mrs. Brown by William Norwish, The Curious Charms of Arthur Pepper by Phaedra Patrick, and Landline by Rainbow Rowell. Our book club discussed Crashing Through by Robert Kurson. 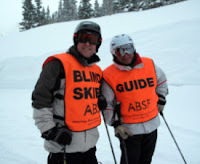 It’s a true story about Mike May, a man who was blinded at age three but who went on to set records for Paralympic downhill skiing. He worked for the CIA briefly, was an inventor and at age 43 he was given a chance at a rare stem cell transplant surgery that enabled him to see. It was fascinating how his sight came back in ways you’d never expect---they never expected. For example, he couldn’t tell faces apart---even his own two sons---no matter how often he saw them. He couldn’t tell genders of people he’d see. He had trouble understanding shadows on the ground, clouds in the sky and so many other things we take for granted. With all the challenges and surprises, was he happy he had the surgery? It took him a long time to decide to do it because it came with a lot of risks from the rejection drugs that go along with transplants, and at first he loved all the colors and shapes but it was mentally very challenging work for him to see and he still needed his guide dog to keep him safe. They never said at end of the book to say if he was happy to have done it or not. He was a curious person and that drove him to the researcher for help making sense of his new sight and he helped them advance their understanding of sight. If I'm remembering right he was only one of 60 people in the world to have this stem cell transplant and only one of less than ten to have been blind since nearly birth. Others who had sight into adulthood, then lost it and got it back didn't have his brain/sight problems. Ouch! Sorry to hear you are losing shingles. Depending on the condition of the roof before they started flying, it could be an expensive proposition. I hope you have good insurance. Sounds like you were stretched pretty thin on Thursday. You are one busy lady! One of my husband's uncles choked to death on a grape. So I guess it happens, although hard to believe with a nurse standing by in the case of your SIL. Crashing Through sounds like an interesting book. I know it happens. A chock was partly responsible for my husband death. We didn't know it at the time but he got some food he was eating into his lungs during a chocking episode where it got infected a few weeks later which led to his dead. He has some minor swallowing issues from his stroke so choking happened a couple times a year. My SIL didn't have swallowing issues at all. I know sometimes people get to talking or laughing while they swallow which can be dangerous. Just sad. Children choke on grapes all the time, that's why they warn parents to cut them up. Book clubs often choose books we'd never choose on our own. That's interesting about the neurons. We've had a lot of wind, too. Did you see that video of the little girl, Madison, who opened her front door just as a gust of wind caught it and swung her around while she held on with one hand? It was something. Her body was practically horizontal as she helplessly blew in the wind. She was not hurt. That is horrible about your sister-in-law. To many things happen in nursing homes. You did have a busy week. I'd take a rest day. I was fascinated by the neurons, too, because we have so many new babies in the family who are learning and busy little bees. Childhood learning experiences can't come early enough and the new mothers in my family are doing a great job. Just heard yesterday we've got another on the way. That will make nine under 2 1/2! My SIL's family member that I talked to said they don't want to example the circumstances too closely. That really does sound like an interesting book! I only occasionally read books but you certainly are tempting me to look in the library's catalog! I feel like I have enough things to do during the day and reading books has dropped off the bottom of my list! I do spend a lot of time reading news and magazine articles so I don't want to sound like I don't read! Although, I have to admit that in terms of ways to take in information, reading isn't the top of my list! I listen to a lot of podcasts (I like doing that when I am sewing) and then I watch parts of the late night shows on YouTube. I find, more and more, that when I am reading, I have to re-read sentences a lot because I have lost my concentration. We have been having really heavy winds as well. Lots of branches down and one big dead tree (not near the house) that we had been hoping would come down for years! And this morning it is -3F. Ugh! My leisure time reading has taken a backseat to reading just to stay up with the world these days, too. Like you, I get more and more of my news from the internet or TV where I can multitask. We have a lot of people still without power around here. Five days without power would be so hard when it still feels like winter outside! I love A Man Called Ove! I haven't read any of the others you listed, although I've looked at a few of them and have them in my wishlist. That's good to know! I put 4-5 of these on my wish list. Thanks for weighing in. I just don't have the mood to read anymore. One of those activities that left, for some reason, when Fred died. I read a LOT more when Don was alive than I do now. I think of the book club as brain exercise because I don't always enjoy it like I did the group I was in before becoming a widow. Same for me after my husband died. I have just joined a book club at my library and have forced myself to read one and trying to do the other. I do so much on my iPad with news, blogs and articles plus the gardening and jewelry making I do for fun, that I simply run out of time. Plus I like TV in the evenings, as it relaxes me. My brain seems to be geared now for quicker things. And I really like to pick my own choice in books too. I think I like the IDEA of being in a book club more than the actual being in one. There is such a long waiting list to get in that it's going to be a hard decision if choose to quit. Gracious your calendar is full. Soon you're going to need a social Secretary. Sorry about your sister-in-law but I think I can understand how such a thing could happen. I can too. I once chocked on a vitamin pill when no one was around and I ended up giving myself the Heimlich. I would love to have a personal assistant! There's a chapter titled "Seeing" in Annie Dillard's wonderful "Pilgrim at Tinker Creek." By good luck, it's been turned into a pdf and placed on the internet. You can find it here. If you don't want to read the whole thing, scroll down to the sixth page, and begin reading where she mentions the book Space and Sight. It's just fascinating. I never would have imagined that newly-sighted people would experience color as shapes, or with texture. The whole world of perception is fascinating. There's some mention, too, of people who wish they never had received their sight. We think that's inconceivable, but it's proof that there are worlds out there far richer than we imagine. I don't know how I missed replying to your post. In this book, they also mentioned that every case study of those who had gotten sight after never having it, wished they hadn't gone through the surgery. I just read your link and those case studies were very much in line with what Mr. May saw or I should saw didn't see. Oh gosh! That pill thing is scary! My mom, late in her dementia, used to choke on her pills, but was always able to get them out of her mouth to try again. We ended up chopping them into tiny pieces and it took an age to get all the pieces down! Thanks for the book recommendations! I'm always ready for a laugh. My friend is in a book club and I'd hate all the depressing books they read. I realize my reading has become very "light" in the past few years but is seems there is so much sadness and horror in the world, that making it part of my "relaxation and entertainment" options is not appealing. A lot of nursing homes mix medications into apple sauce to get it down. Must be a scary way to die but at least it's quick. I couldn't read depressing books now, with all the crazy junk going on in the world lately. What too much 'required' reading to keep up, too. So sorry about your shingles and hope it isn't a major repair. That is just too sad about your SIL. That should not have happened. That book sounds facinating. I will check it out. Thanks. The missing shingles are right on the side you see when you come up the street and it looks like puzzle pieces are missing here and there. Looks terrible! The second half of the book, after he gets his sight back is the most interesting half. The choking death scares me. I've been in that situation a few times and its terrifying. An awful way to die. I will check out the books. I have to say that reading fiction has lost its allure. Real life politics is so much more fascinating. The only downfall is that I can't skip to the end, and then return to a more leisurely read of the novel, as is my usual practice. My emotions went up and down as I read of Mr May's life. Losing my vision is my nightmare. To read of Mr May's regaining his sight was wonderful, and I suppose I expected a "happy ever after", but real life is messy. Commiserations on the shingles/roof - I hate those "projects" involved in ringing around for quotes and being given the runaround, and then having to make decisions. I bet you've lost quite a bit of weight with your busy schedule. I know I did a few years ago when I joined the Y and was busy in house renovations. No time to snack + the exercise did their bit. Libby, I'm glad my punctuality is noticed and appreciated. I do it for myself, mostly, because it gives me a rhythm to my life and because forcing yourself to write when you might not want to is good for sharping your writing tools. I'm afraid that my shingle job will be too small to attract anyone to want to come out to fix it but I'm going to start with a guy I know who builds houses, see if he can recommend a roofer. Haven't seen him since Don's funeral but he'd trust anyone he'd recommend. A neighbor two doors down had a roofer last summer who did a great job, I'm thinking I can walk down there and get a name, too. I had a pig-out day on Irish Soda bread today, so I probably ruined my hard work from last week. But other than that, I've stuck to a good plan and have seen results. Nothing dramatic, though. The older I get the harder it is to take off weight! I, too, love and appreciate your blogging often AND predictably! Unfortunately, I am still not in to reading yet. I think I have to give up Facebook and few other things so I can read before bed! Another word for 'predictably' is 'boring.' LOL Just kidding. Thank you! I've been falling asleep reading the past few weeks. The new book we just got for club is LONG---All the Light we Cannot See---so I'm going to have to find another time and place to read. Facebook and other computer stuff before bed is supposed to bad for sleeping. So I've been avoiding them for that reason. On an entirely unrelated note -- you made a comment once about my being able to insert links into a comment's text. I just happened to run across this html page over on the Wordpress support site. It has everything you need to know, and is nicely laid out. Thank you! I bookmarked the page for future use. Thanks for including the book recommendations, especially since I'm not familiar with any of them -- so many books, so little time!! I never thought about there being an investigation of the circumstances of her death...and I know you're right. It bothered me that the family didn't want to question the incident. I understand them feeling that way but the home having to face a review could help someone else in the future. And I forgot to say how sorry and sad I am for your loss. And the circumstances are horrible. I agree it should be investigated ... to save a future life at the very least. If her immediate family won't initiate, can you send an anonymous letter? Thank you. I think stepintofuture (above) is right. The state automatically investigates all nursing home deaths. Chocking would trigger a deeper look. I also think that what the family said at the time could change over the next month/s when they've had more time to think about it. I'm having lunch with her daughter in a few weeks and I plan to feel her out on topic. Sorry to hear about your sister - in - law. After my mother died in a nursing home, I really believe that a place like that is just a place for people to die and the people working there really don't care about the old people. My mom was only in the nursing home for months and she had already fallen 7 times. When I tried to get to the bottom of the situation, they fought me tooth and nail and I still wasn't able to find out what really happened. All they do there is over dose the people. They really don't care. I believe that they can't wait until the person dies and another person enters to die. As you can see Jean, I'm still angry and my mom has been dead for three years.
" Crashing Through " sounds like an interesting book especially since it was a true story. Well it's time to go my friend. Enjoy your Saturday. See ya. Paul, I understand your pain of unanswered questions and suspecting human err or neglect. My mom, too, died of circumstances that did include mistakes by a doctor and then an ambulance that caught on fire on the way to the hospital. Fast forward it took two years to get answers and by then the doctor had lost his license and a class action lawsuit had been started against the makers of the ambulance because fires were happening all over the country, not just on the one my mom was in. My family did not take part in the lawsuit but it did help me finally get closure to a very painful event in my life. I hope you find a way to make peace with your pain...your health depends on it. I think I've been able to find some peace since mom died but every time I hear able a problem dealing about a nursing home, it bothers me that it's still occurring around in Canada & the US. I think it just bothered me because today was the ( 17 years ) that my dad died. I guess, no I do still miss both of my parents even though I'm a grandparent today. That's life ( and death ) my friend. See ya later this week and keep warm Jean. Sorry to hear about your SIL. Hope everyone is able to receive answers to satisfy their concerns about her death. I recall giving my young son an intervention similar to Heimlich due to a lifesaver. You certainly had quite a day. Recall finding pieces of shingles in our yard years ago -- not a welcome site, so don't envy you. Finding service people we can trust can be a challenge, especially for widows, I think. I find brain neurological functioning fascinating and enjoyed Oliver Sack's writing. He addressed some most unusual cases. Individuals writing about their experiences as in the book you describe would be especially interesting. A second language, for example, is typically learned in a different brain area after puberty for most people than in children before then. So, learning a second language is generally most easily acquired when young, but many people resist allowing that to occur. Hearing often has to be re-learned as a former blogger who had a cochlear implant described -- music she recalled from years earlier not only didn't sound the same but wasn't even pleasant. As for the neurons -- "use it or lose it" is a concept that's more than just words -- just like our physical functioning. The "use it or lose it" gives me a wonderful excuse for spending so much time on the computer and to indulge myself with books and movies. I like learning new things. That's interesting about the cochlear implant. The brain is certainly a complicated and fascinating thing. P.S. My S-I-L's family---at least those I talked to---are just going to accept the nursing home's story and not dig into it. I do understand that mindset---that the quality of her life living there wasn't that great and they couldn't let her live alone anymore.